Leslie Model 125 | MOSweb Online! This is a small single drum single speed Leslie with a 12″ driver. 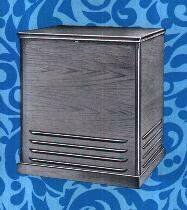 The cabinet is about the same size as a 145 but has no upper horn and hence no upper louvers. It is essentially a model 25 with 2 speed operation (Tremolo and Chorale).